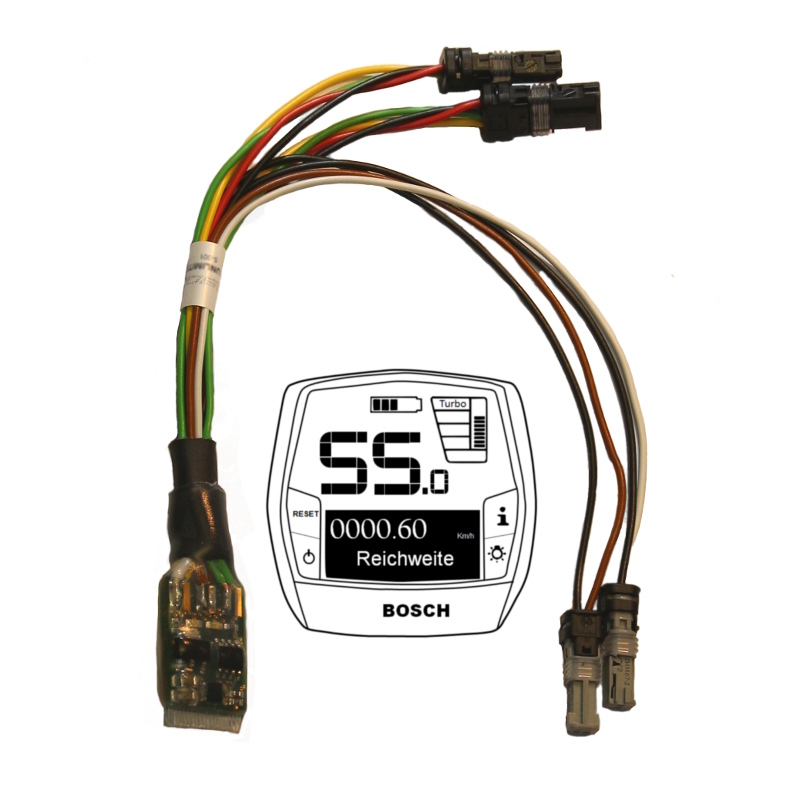 With the new digital ASA Speed tuning module you can remove the speed limitation of your Bosch (or Yamaha) electric bike without affecting the functionality of your HMI. This means: If you use this amazing tuning tool your display will always show the actual speed – regardless if the tuning is activated or not. The functionality of your HMI will remain completely unaffected – in particular the tachometer and all additional features like the covered distance as well as average- and maximum-speed etc. In addition, no error code 102 will be generated in 2:1 gear ratio situations anymore. This tuning module removes the engine speed limitation in the “Sport” and “Turbo” modes automatically (other modes can be programmed user-specific). Summary: If you use the ASA SPEED tuning module the engine support isn´t limited to 25 km/h (or 45 km/h) anymore. In principle, you can reach unlimited speeds with the ASA SPEED tuning tool – and best of all, after the installation your electric bike will work exactly like it used to do! The microprocessor-controlled electronics of the module will adjust automatically to the different wheel sizes (self-calibration). You don´t need any additional switches, Dongles or cables etc. The ASA Speed will stay invisible. The operation of the tuning tool is done via the control elements of the HMI. The installation of the ASA SPEED tuning tool is done with original Bosch plugs so that no cables have to be damaged. This means: If you want to use your electric bike legally on public roads again, you can restore its original condition at any time. Please note: You need “special tools” to open the engine compartment (ISIS crank puller and, in addition, a Spider tool for Bosch Classic engines). Important: If there are problems with the display of the correct speed, a self-calibration of the ASA Speed module is generally helpful. Follow the instructions in the enclosed operating instructions. The new Bosch engines with support until 25 km/h can be tuned with the ASA Speed B25.14 tuning module. Compatible with Bosch Active Line + Performance Line (from year of construction 2014 and later). Even compatible with the new Bosch Performance Line CX. Not compatible with Bosch Classic Line and Bosch engines before 2014. The new Bosch engines with support until 20 mph can be tuned with the ASA Speed B32.14 tuning module. Compatible with Bosch Active Line + Performance Line (from year of construction 2014 and later). Even compatible with the new Bosch Performance Line CX. Not compatible with Bosch Classic Line and Bosch engines before 2014. Tuning for the new Bosch S-Pedelecs (350W) with motor support until 45 km/h: The ASA Speed B45.14 for the new Bosch Active & Performance Line engines (from year of construction 2014 and later). Even compatible with the new Bosch Performance Line CX. Not compatible with Bosch Classic Line and Bosch engines before 2014. The ASA Speed B25.13 is the ultimate tuning module for Bosch electric bikes (Pedelecs) with motor support up to 25 km/h. Suitable for construction year 2011-2012 (HMI), 2013 Intuvia (until 25 km/h) incl. 2014 Classic Line. Not compatible with 2014 Bosch Active & Performance Line. The ASA Speed B45.13 is the ideal module for Bosch S-Pedelecs (350W) with motor support until 45 km/h. Suitable for construction year 2011-2012 (HMI), 2013 Intuvia (until 45 km/h) incl. 2014 Classic Line. Not compatible with 2014 Bosch Active & Performance Line. The ASA Speed Y25.01 is a tuning tool especially for electric bikes driven by Yamaha Powerdrive systems (and equipped with Yamaha displays). It takes away the systems 25 km/h speed limitation completely, which allows you to reach unlimited speed values with full motor support. Actual speed and other parameters on the Yamaha display will be shown correctly. The device is not compatible with Yamaha SyncDrive or PW-X drive systems.